LONG BEACH PENINSULA, Wash. – July 2018 – The Long Beach Peninsula, located in the southwestern-most corner of Washington State, will be host to a new festival showcasing the extraordinary birding opportunities in and around this 28-mile long finger of land. Slated for Saturday, Sept. 29, “Wings Over Willapa” will celebrate the region’s birds and nature, as well as the art they inspire with classes, workshops, guided tours and more. The event is timed to the start of fall migration in this key migration area along the Pacific Flyway. Among the many tours offered will be an East Sand Island kayak trip, a bird walk at Cape Disappointment State Park, a pelagic trip departing from Ilwaco, “Beach Birding by Bicycle,” two barge trips into Willapa Bay, as well as self-guided tours at Tarlatt, Teal and Greenhead sloughs. Guided tours of the Leadbetter Unit of the Willapa National Wildlife Refuge will include one of the beach and dunes and another with an animal tracking specialist of the bay and forest side. Presentations will include beginning birding, nature photography, shorebirds, pelagic birds, eBird, among others. Bird box building, a decoy carving demonstration, beach baskets, feather raku pottery, stationary making, and a paint and sip class are some of the indoor offerings. Capping off the day will be a gathering with a keynote speaker, food and drink, and a silent auction at the Columbia Pacific Heritage Museum, the event headquarters. 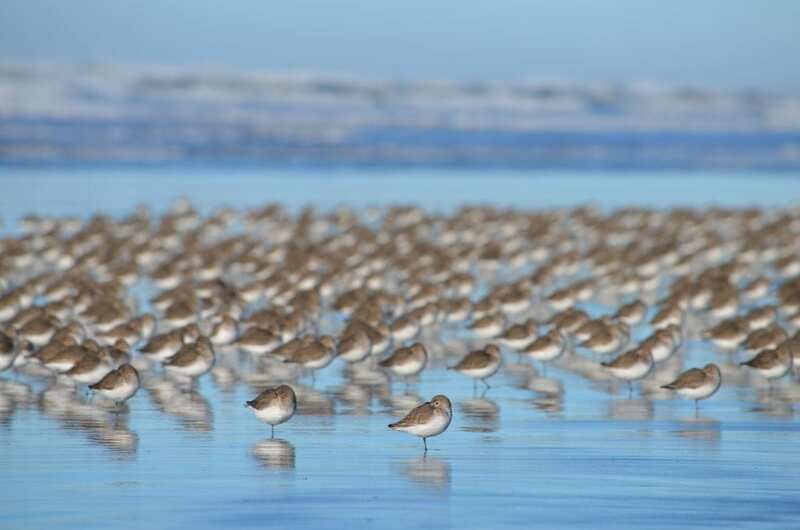 Designated sites of international significance by the Western Hemisphere Shorebird Reserve Network, Willapa Bay and the Long Beach Peninsula boast many and varied habitats within a concentrated geographic region as well as relatively easy access to prize birding spots. Tidal mudflats, along with adjacent salt marshes, pastures, and outer beaches, provide large concentrations of shorebirds with diverse habitats that are critical for feeding and roosting. This region represents the largest remaining area of tidal mudflat habitat and coastal salt marsh habitat in southwestern Washington and the second largest estuary on the United States Pacific coast. Hundreds of species of birds nest or migrate through Pacific County. Highlighted species include snowy plover, pygmy owl, and peregrine falcon. More common sightings are of a number of gulls, bald eagle, brown pelican, and great blue heron. Seasonal sightings include sanderling, trumpeter swan, snowy owl, dunlin, merlin, black bellied plover, and many more. Bordered by the Pacific Ocean, Columbia River and Willapa Bay, the Long Beach Peninsula has been a favorite rest and recreation destination since the late 1800s. For lodging, restaurants and things to see and do, please go to www.visitlongbeachpeinsula.com.